Bondability to ABS and regulatory pre-compliance have enabled a Medalist medical elastomer from Teknor Apex Company to play a key role in a device that simplifies the delicate and often complicated deployment of catheters and guide wires for interventionalist procedures, which are less invasive alternatives to surgery. Interventionalist methods, such as the placement of stents to open blocked arteries, typically require the insertion of catheters with guide wires into blood vessels and may involve more than one pair of these devices, as in the case of blockages in both main and branch arteries. The new Teirstein Edge device, developed by Paul S. Teirstein, M.D., lets interventionalists organize catheters and guide wires at a site just prior to insertion of the wires into the catheters, keeping them neatly separated and readily identifiable while allowing precise control of their movement during procedures. The device incorporates clips for attachment to surgical towels and has a curved underside that enables it to lie on a flat surface or over a patient's leg. Using two-component injection molding, elastomer specialist Da/Pro Rubber, Inc. produces the Teirstein Edge device for Dr. Teirstein's company, Shepherd Scientific. 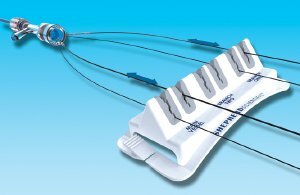 Da/Pro molds Medalist MD-305 elastomer onto six sites in a one-piece ABS base, forming slits for the placement of up to three catheter/guide wire pairs (see photo). The rubber-like traction of the Medalist compound and its elastomeric "give" combine to enable the slits to hold the catheters and wires securely while permitting them to be adjusted or removed without being bent. The intricate design of the inside edges of the slit accommodates devices of different diameters and permits forward and backward movement or, at the bottom of the slits, no movement at all. These features are demonstrated in a video on the Shepherd Scientific website. "Because interventionist practitioners are hypersensitive to the 'feel' of the devices used in their procedures, we went through a number of prototypes, varying the slit geometry and durometer until we arrived at just the right combination," said William D. (Bill) Morrison, plant manager at Da/Pro's facility in Newburyport, MA. "We considered several other thermoplastic elastomers but chose the Medalist compound because it chemically bonds with the ABS substrate and was already compliant with the relevant regulations." The Medalist program for medical manufacturers now includes 28 standard high-purity elastomer compounds, along with a comprehensive body of test data and resources for designers and processors. Compounds are available with Shore A hardness from 5 to 87 and include clear, translucent, and opaque formulations. An expandable registered binder with extensive data on Medalist products is available to qualified OEMs, designers, and plastics processors in the medical device and healthcare product industries.